Keep both feet on the ground with our test of anti-slip products. Patios, decks and paths you stride along without a second thought in dry weather become a serious risk for slips and falls when wet. Inside, polished wood, tiles and vinyl flooring can also send you flying if they get wet. We measured the grip levels of indoor and outdoor anti-slip products, including paint, coatings, and stick-on grips, along with a few concrete, timber, vinyl and tiling products. See our table below for how the products did when tested in a laboratory using a rig that simulates a shoe walking on a surface. 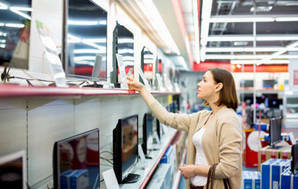 Which products work best indoors? Untreated, textured slate (left) and terracotta (right) tiles were the grippiest indoor flooring products in our test and don’t require any additional treatments. We measured the friction of polished and glazed porcelain tiles, and used them as our baseline for the most slippery indoor flooring products you can buy. Then, we applied a range of anti-slip treatments (both professional and DIY) to samples of each porcelain tile. We also measured the slip-resistance of untreated slate, terracotta, granite, and textured and matte porcelain. 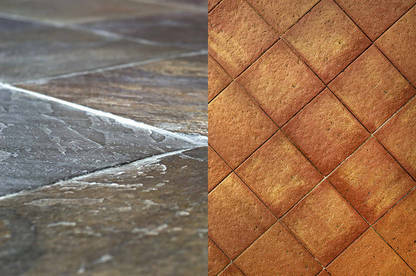 Untreated, textured slate and terracotta tiles were the grippiest indoor flooring products in our test. Both earned our maximum five-star rating, so they don’t require any additional treatments. We think three stars are the minimum required for a product to earn the name “anti-slip”. See our table for more information. We then tested four DIY anti-slip treatments. 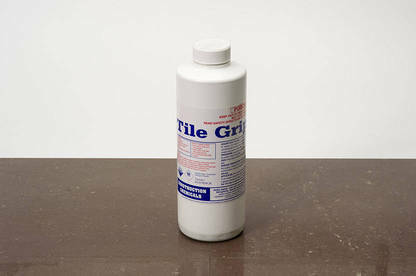 Only one provided a good level of slip-resistance on polished porcelain (Tile Grip). None of the DIY treatments worked well on glazed porcelain. Applying these treatments requires spreading a thin film over the tiles, which eventually wears off with use so you’ll have to repeat the process. Of the four DIY anti-slip treatments we tested, only Tile Grip provided a good level of slip-resistance on polished porcelain. The professionally applied treatments returned much better performance, especially on glazed tiles. But they’re more expensive on average than the DIY treatments as you have to pay for labour. Before going for either treatment we recommend seeing a sample of what the finished product looks like, especially for etching as this can dull the glossy finish of your tiles. If you walk around in bare feet you should also consider the surface will feel rougher. We tested two generic vinyl products as our baseline for the slip resistance of budget vinyl, then measured the friction of a vinyl marketed as “slip resistant” (Novilon Aquagrip Prima). It was a marked improvement on the generic vinyl, earning three stars. And the best products for outdoors? After the lacklustre performance of many of the indoor products, we were pleased to find all the outdoor anti-slip products had a level of grip above the minimum required for commercial applications (three stars or above). We tested paints and coatings for smooth concrete, decking timber and tiles, along with a range of stick-on grips. We found textured untreated slate and terracotta tiles provided five-star levels of grip, so they’re more than grippy enough without additional treatment. Textured porcelain was more slippery, but still had enough friction to earn three stars. We also tested the professionally applied 97008T Clear Coating for existing tiles (and smooth concrete), which performed very well with little discernible change in the surface’s appearance. We applied a range of paving paints to smooth concrete. 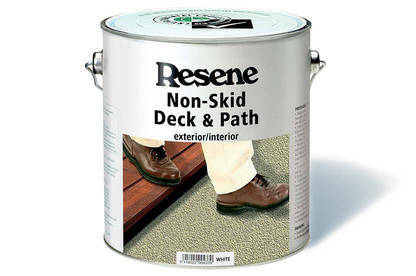 We had to add a low-slip additive to all the paints, except the Resene Non-Skid Deck & Path, which came with the grit added. They all scored five stars, apart from the Bondall Garage & Factory Floor Protector, which earned four, the same level of grip as dry, untreated smooth concrete. Our baseline figures for decking timber were from a test of untreated grooved radiata. It scored two stars, showing it’s likely to be a wet-slipping hazard, especially if the timber had any moss or slime build-up. We then applied paving paints to the timber. Both paints improved the timber’s wet-slip resistance, but the enamel paint was more effective than the acrylic paint. The anti-slip coatings also performed well, but the pigmented 9700 Series was better than its clear-coat counterpart. We rounded out our test by looking at stick-on anti-slip treads and tapes. While they look more at home on a factory floor than a garden path, they were all five-star products and extremely effective at increasing friction in outdoor areas. You probably don’t want to cover your patio in black tape, but it can be a great option on stair nosings and as strips on sloping paths. 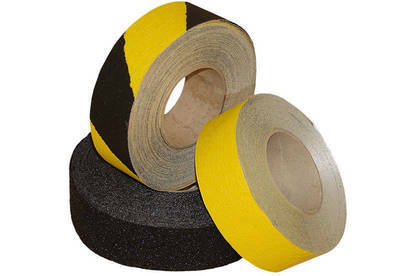 Yellow, reflective or glow-in-the-dark strips are worth considering as a way to increase visibility on dark pathways. 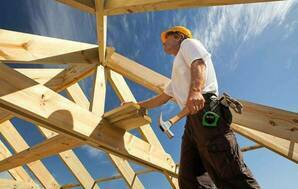 In 2015, slips, trips and falls in home caused a staggering 363,000 ACC claims, costing $260 million. Of claims where the cause is known, the most common area for falls causing injury was the garden, where 35,000 of us were hurt last year. Next was the bathroom, with 17,000 claims, followed by the bedroom at 14,500. Securing mats, rugs and loose carpets using rug underlays and making sure loose carpet edges are stapled down. Not carrying big loads — make a few small trips instead. Getting into the habit of tidying up, especially if your children like to leave toys in high-traffic areas, or if you’re expecting an older visitor. Keeping outdoor areas clear of leaves, and don’t let moss or slime build-up on decks and paths. Ensuring steps and stairs are well-lit, both indoors and outdoors. Our test is based on the AS/NZS4586 standard for slip resistance. Three stars corresponded to a coefficient of friction of 0.4, the minimum level of grip required for commercial applications. We think you should only consider products in our table scoring three stars or above. Indoor flooring products usually aren’t marked with any type of anti-slip rating. However, many indoor and outdoor tiles feature PEI (Porcelain Enamel Institute) ratings. These indicate their suitability for foot traffic, ranging from one for wall tiles to five for heavy-duty commercial foot traffic. GUIDE TO THE TABLEAwith Solpah low-slip additive. Bwith White Knight Pave & Deck additive. Most anti-slip treatments work by increasing the roughness of a surface. However, this makes the surface more likely to retain dirt, so it’ll need regular cleaning or the surface will lose its anti-slip properties. Cleaning non slip concrete or ceramic tiles?? 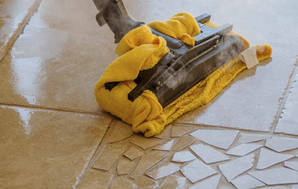 How are you meant to clean non slip tiles with a rough surface. You can't wash with a cloth or mop as the fabric just sticks to the tiles. Externally you can scrub them then hose them off and leave them to dry but internally cleaning is extremely difficult? Re: Cleaning non slip concrete or ceramic tiles?? We have recently resurfaced our out door wooden ramp with TREADGRIP ruberised water based non slip paint, and we believe it is the best product we have used for that purpose. Two coats required for a good non slip surface.